Leslie McAllister didn't have to look to hard to find this week's street fashionista. Guys, take notes; ladies, he's taken. I like "man style" (said in a cheeky tone). There is something about the way a man dresses that makes him so "manly." Maybe it's that the trends rarely change and we almost always know what to expect. Maybe it's because jeans and a T-shirt on a man always work (look at James Dean; his brand of 'cool' is still relevant after 50 years). Maybe it's because of my obsession with James Bond in a classic black suit that makes my bowtie twirl. Maybe it's because boys are so darn cute! It's not that men have it easy, rather they make it easy. Fashion for guys is simple and classic; always. Even when they are punked-out, they are still wearing jeans and T-shirt in some form - maybe ripped, maybe studded. Think unexpected! A sweatshirt with a button down underneath; it's mixing casual and classic. Add a Fisherman's knit hat or a sweet scarf and you're set. Deconstruct the suit. Do just the vest with a crisp white shirt and trousers or a blazer with jeans (my favorite look). Maybe that blazer is black velvet? Want to put the three pieces back together? Fine, but keep in mind that suits today are not a relaxed fit; they are tapered and tailored – think of a modern slim fit. It makes even the wayward man seem dapper and dandy. And shoes? Chukkas, Beetle boots or Chuck Taylor's – they are fashion's booties for guys. This is who you want to emulate: Hedi Slimane creative director for Yves Saint Laurent (made his mark with Dior Homme). He is the modern man. He makes the leather jacket his suit coat and pairs it with jeans, a dress shirt and a skinny tie. Everything is fitted and tight. Find him, follow his lead, and make him your fashion mentor. Why James? He pairs the casual and classic really well. He makes the basic kind of edgy. A no-fuss kind of style. Simple. Manly and boyish at the same time. Being a skateboarder, he has this kicky, cool style that stems from buying clothes from skateboard companies that design really nice stuff. He stays current by mixing up trends and styles and adding a twist or an ollie or a 360-tail grab. Describe your style. Growing up as a skateboarder/snowboarder, there was a constant need to be comfortable. So through the years, I have tried to develop the idea of comfort and keep it classic and simple. Jeans and T-shirt, clean black dress shirt, nice fleece jacket. Whatever represents comfort with a hint of style and function. Who do you admire fashionably speaking - whose style inspires you? I would have to say everyone. Style changes all the time. I mainly look for things that enhance my style or take it in a different direction. I know winters can be dreary in Erie, but what are you looking forward to this winter? How will you beat the chill? Snowboarding has always been a staple of getting through my winter blahs. I am not much of a "gym" person, which forces me to keep active outside. I also try my best to leave right around March to get a couple weeks in a warm destination. That cuts the long winter in half and makes it less painful. Favorite places in Erie to get a Greek Dog? Favorite Greek dog is the little square building at Sixth and Peninsula [Peninsula Gateway aka "The Greeks"], but since that closes in the winter, Panos is always a nice quick and cheap Greek dog destination. Tell us about what you do on the side. Besides running my two small businesses (and looking for new ones), I like to write and act. I am currently working on some sketch comedy and a website to seriously start promoting my "creative" side. If you could be one animal what would you be and why? Without a doubt a monkey. Not so much that a monkey has any great attributes or is very exciting. I'm pretty much already a monkey. Where can people find you on a Saturday night? Or rather, what's your favorite watering hole? Saturday night is the best night to get together with friends and discuss the monotony of the week's events. As far as a place we drink on a Saturday night, it is someone's house, camping or the Lager Café; ask for Kista! 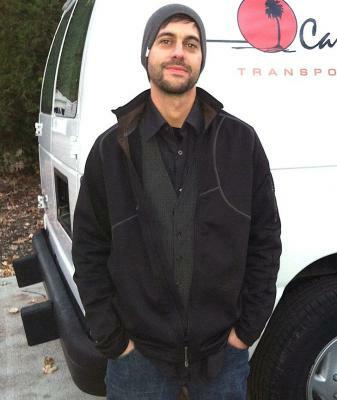 Jim is the sole owner of Canfield Transportation, a local courier company that transports all sorts of things. You can see his big white van zipping around all over town – the logo is inspired by the Mr. Bungle album "California." PS: He is always looking for new clients (*wink wink*). Feel free to contact him at jamescanfield@yahoo.com.